We believe the meal for your once-in-a-lifetime moment, your tournant, should reflect this extraordinary occasion. Our meals celebrate both time and place, drawing inspiration from the seasons and local bounty from land and sea. 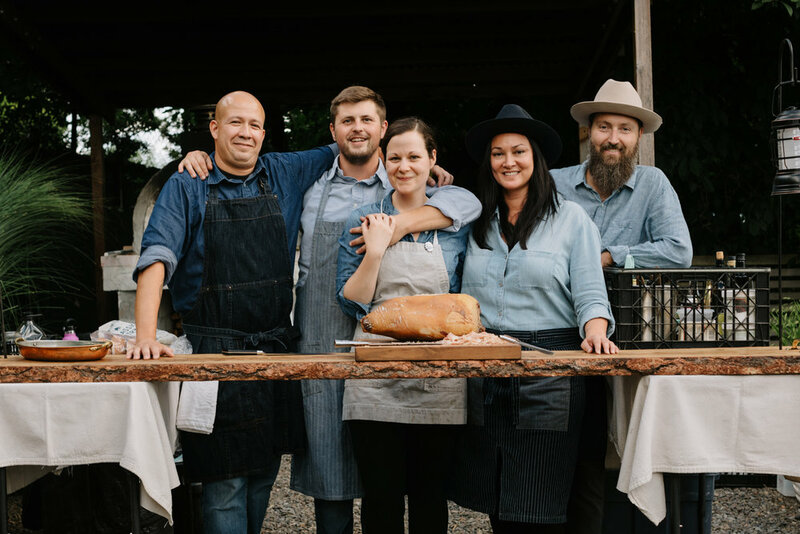 We love nothing more than to turn a meal into an experience and specialize in live-fire cooking, family-style feasts and items meant to be eaten out of hand. To us, the best food is prepared simply and honestly, with excellent technique, allowing the ingredients to shine. 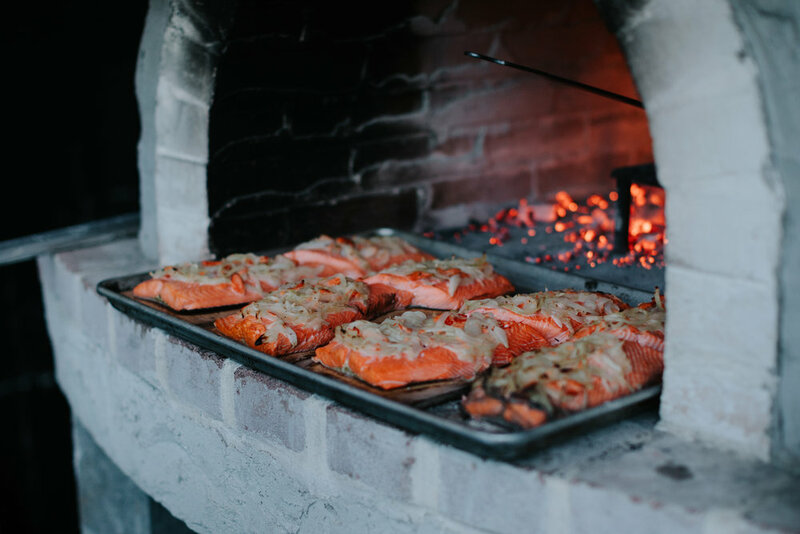 We source exceptional ingredients from local farmers, ranchers, fishermen and foragers, then prepare everything fresh onsite with great thought and care. These are the basic principles of our approach to cooking and serving a meal. We believe in starting with the best local, seasonal ingredients and preparing them simply but thoughtfully. We like to forge connections with our guests – with the food, the cooking process and, most importantly, with one another at the table. We have given a tremendous amount of thought to how our food is best presented and enjoyed within the context of a wedding celebration, so that you can relax and enjoy the day, knowing that your loved ones are cared for and nourished. Our wedding experience as outlined above begins at $100/guest. Dessert Table - Lovely spread of cookies, petite sweets and ripe summer fruits. 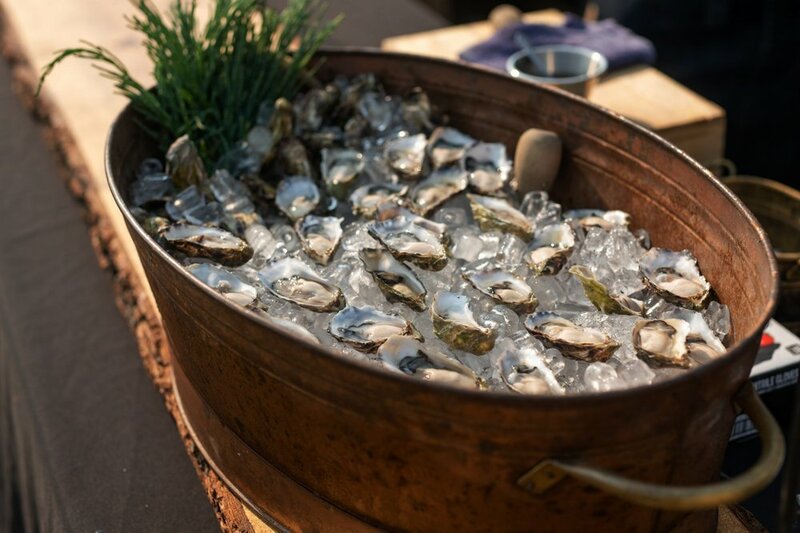 Oyster Bar - Freshly shucked Pacific oysters on the halfshell with ginger shallot mignonette. Virginia Country Ham - Like American prosciutto; hand sliced on site. Custom welcome cocktail: $10 per guest. We recommend our friends at Merit Badge for full craft cocktail service. Prices are listed per case (60 glasses) and are dependent on final selections. Prices are listed per case (24 bottles) and are dependent on final selections. Tournant will be responsible for procuring all necessary cooking and service-related rentals, including mobile kitchen set-up, cooking equipment, service platters/bowls, service utensils, etc. 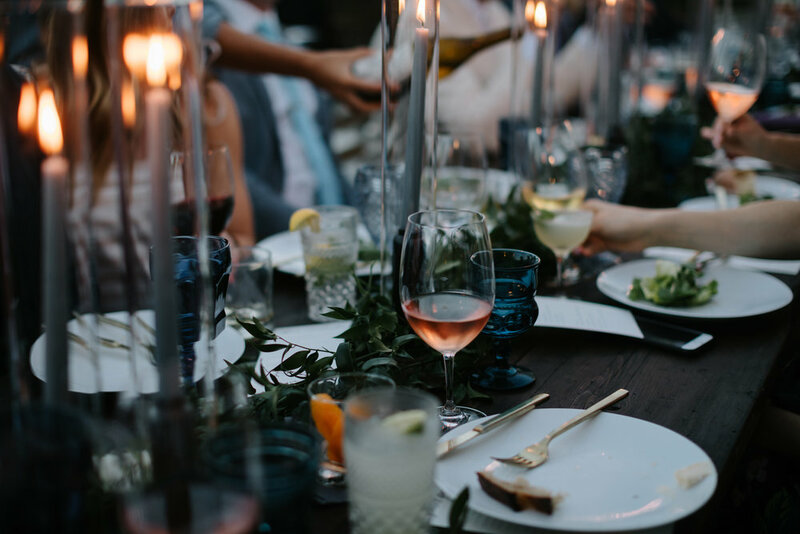 Although we do not offer full-service event planning, we are happy to help guide other rental selections (tables, chairs, table settings) or hire a coordinator to help with the process. For events over 80 guests, it is highly recommended that you work with a wedding planner to facilitate event design and day-of coordination. A 20% production charge is included to help us cover services such as menu consultation, site visit, rental coordination, planning, procurement, liability insurance, vehicle and equipment expenses, workers’ compensation and other incidentals. Gratuity, while not expected, is always appreciated for exceptional service. All staff is billed hourly with a 6 hour minimum. Staff fees are based on best estimate with any additional hours billed post-event. In general, most weddings require 2-3 hours for load in and set up and 1-2 hours for break down and load out. For overnight events and events out of state, staff is billed at a flat day rate (please inquire). Travel and site visit fees will be assessed if your event is located more than 20 miles from central Portland. For events located more than 2.5 hours outside of Portland, overnight accommodations for staff will need to be addressed. A $1,000 deposit will reserve your event date as we work together toward a final contract. This amount will be applied to your final balance. 50% of this initial deposit will be refundable should you choose not to enter into contract with Tournant. 50% of the total costs will be due upon signing of contract. The final balance is due at least ten (10) days prior to event date. If client cancels the event before ninety (90) days prior to the event, Tournant shall retain fifty percent (50%) of deposit. If client cancels the event within ninety (90) days of the event, Tournant shall retain the entire deposit. If client cancels event within seven (7) days prior to event date, Tournant shall be owed the total amount of estimated charges due.